Dell is returning to the ownership of its eponymous founder. And I for one think that could be very good news for the PC industry. Actually, it's a bit more complicated than that. A combination of Michael Dell, Silver Lake Partners investment fund, a couple of billion dollars thrown in by Microsoft and a whole lot of debt adds up to a $24.4 billion deal. Any time Microsoft sticks an oar in the conspiracy theories really begin to flow. And Maybe Microsoft has some master plan at play. We'll see. For now, the reason I find the deal interesting involves innovation and making new technology cheaper, things the PC market arguably has lost sight of. A swarm of mobile devices are currently feasting on the PC's market share and it's high time the PC began to swat some of the pests. So, where does boring old corporate Dell come into the picture? In its current state, it doesn't. As a public, listed company in thrall to the markets and under constant pressure to deliver every business quarter, Dell looks like an enormous cash-generating zombie. OK, it's rolled the dice here and there on a few vaguely interesting products, like the failed Dell Streak tablet. But for the most part, there's been very little to get excited about in recent years. Right now, Dell remains the world's third largest PC maker behind HP and Lenovo, but has been on the slide. The latest figures from Gartner show Dell shipments plummeting by 15 to 20 per cent across various international markets. It's ugly. Overwhelmingly, then, Dell has the look of an ultra conservative outfit, a business driven by bean counters and measured in margins. But isn't that what Dell always has been? A company that ran lean? A company whose very raison d'etre was to maximise value for money for customers, not provide a technological lead? Perhaps. But Dell also has a strong track record of leading the way on technology, both in terms of being first to market and in terms of bring advanced technologies to lower price points than ever before. Much of that came down Dell's sheer purchasing power. Back when Dell was market leader, if you've had a new mobile video chip for laptop PCs in limited supply and Dell wanted it, Dell got it. Likewise, Dell's massive scale meant it could negotiate big discounts on components and pass some of that onto consumers. Dell was among the first to bring things like full-HD widescreen displays to laptop PCs at an affordable price point and it lead the way in powerful portable graphics. But there was more to Dell's innovation than picking a few prime components. Dell lead the way in bringing high resolution desktop monitors to a more affordable price point. First there was the 2407FPW, a 24-inch 1,920 by 1,200. Then came the monumental 30-inch 3007WFP and its 2,560 by 1,600 grid. Dell was also very aggressive with its PocketPC products for a while, producing some some powerful machines that you could argue were ahead of the curve. It's just a shame the market and software environment wasn't ready for them. But with Dell now returning to private ownership, a longer term view can be taken. Dell no longer has to score every quarter and has the option – gasp – of investing in more innovative products. If anyone can bring 4K UHD displays to market for a reasonable price, it's Dell. Likewise, Dell has always been a little bit better at consumer-focused kit than HP and Lenovo, so it would be fascinating to see what the full weight of Dell's resources and a renewed focused allowed by private ownership could come up with in terms of a Windows 8 Pro tablet. It probably wouldn't be absolutely the slickest looking on the market. But if Dell went back to its old ways, it would have the best screen, the fastest chips and the biggest battery, all the while undercutting most of the competition. 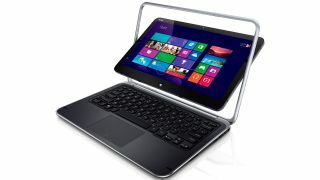 The Dell XPS 12 looks interesting. But I reckon Dell can do even better.